First spacecraft to maneuver in orbit. First manned flight of Gemini spacecraft. First American to fly twice into space. Manual reentry, splashed down 97 km from carrier. AKA: Molly Brown (from Broadway play 'The Unsinkable..'). Launched: 1965-03-23. Returned: 1965-03-23. Number crew: 2 . Duration: 0.20 days. Location: Grissom Memorial Museum, Mitchell, IN. Virgil I. Grissom and John W. Young entered an elliptical orbit about the earth. After three orbits, the pair manually landed their spacecraft in the Atlantic Ocean, thus performing the first controlled reentry. Unfortunately, they landed much farther from the landing zone than anticipated, about 97 km (60 miles) from the aircraft carrier U.S.S. Intrepid . But otherwise the mission was highly successful. Gemini III , America's first two-manned space mission, also was the first manned vehicle that was maneuverable. Grissom used the vehicle's maneuvering rockets to effect orbital and plane changes. Grissom wanted to name the spacecraft 'Molly Brown' (as in the Unsinkable, a Debbie Reynolds/Howard Keel screen musical). NASA was not amused and stopped allowing the astronauts to name their spacecraft (until forced to when having two spacecraft aloft at once during the Apollo missions). The flight by Young was the first of an astronaut outside of the original seven. Young, who created a media flap by taking a corned beef sandwich aboard as a prank, would go on to fly to the moon on Apollo and the Space Shuttle on its first flight sixteen years later. During the first two days of March 1965, the Office of Manned Space Flight held a Design Certification Review in Washington. The review board asked for, and got, formal pledges from the top executives of all major Gemini contractors that their products were ready for manned space flight, barring something unforeseen turning up during what remained of Cape checkout. A week later, the spacecraft Flight Readiness Review revealed only minor and quickly corrected problems. The launch vehicle passed its final test, simulated flight, on 18 March and its Flight Readiness Review on Saturday morning, 20 March. When the Mission Review Board met that afternoon, weather was the only thing that might delay the mission. Early Monday morning, the launch vehicle contractors confirmed that GLV-3 Was ready to go; at 9 a.m., the Flight Safety Review Board committed the booster to launch. Martin's pad crew started loading oxidizer aboard GLV-3 at 6:22 that evening, 22 March, and five hours later all tanks were full. The final countdown began at 2 o'clock Tuesday morning, under overcast skies. Included in the countdown were static firings of both spacecraft rocket systems. This had been a matter of dispute between the astronauts and the program office. They agreed on plans to fire one ring of the reentry control system but not on OAMS firing. GPO, backed by the Preflight Operations Division, preferred to fire only the lateral thrusters, but the pilots wanted to fire the aft thrusters too. The matter was settled in May 1964, when NASA Deputy Director for Gemini William Schneider decided both would be fired. Although he knew that the extra test time might affect the launch, he believed "that this will save time in the long run and will increase the confidence in flying a successful mission." Grissom and Young, who had reviewed their flight plan and gone to bed about 9 o'clock the night before, were awakened shortly before 5 a.m. After steak and eggs, a launch-day breakfast tradition inherited from Mercury, they were driven from their Merritt Island quarters to pad 16, site of the preflight ready room. They arrived about 6 and had their suits on about 45 minutes later. Shortly after 7, a van bore them to pad 19. They mounted the elevator for the 11th level, where their spacecraft awaited them. At 7:30, they were inside with the hatches sealed. Because the so-far flawless countdown had moved faster than expected, they were about 20 minutes ahead of schedule. Young later complained about this extra time spent flat on his back and fully suited; the planned wait was bad enough. Weather was still the big question mark, the overcast not having lifted as expected. Grissom and Young had been in the spacecraft less than an hour when the count was halted, just 35 minutes before launch, because the first-stage oxidizer line had sprung a leak. A handy wrench applied to a poorly seated nut solved the problem, but the count was held for 24 minutes to make certain the leak had stopped. By the time the countdown resumed, the clouds over the Cape had begun to scatter. Thirty-five minutes later, at 9:24 Tuesday morning, 23 March 1965, the sky was almost clear when the engines of GLV-3 burst into life. With a "You're on your way, Molly Brown," from CapCom (capsule communicator) L. Gordon Cooper, Jr., the third flight of Gemini, the first to which men entrusted themselves, began. 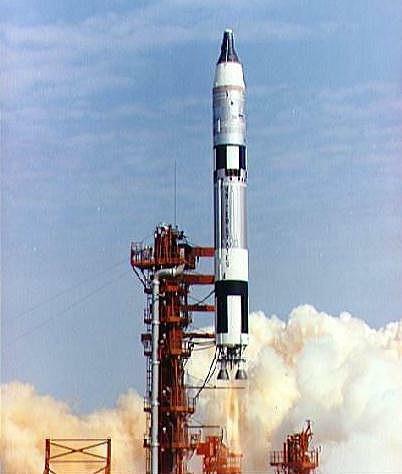 Officially the flight of Gemini 3, unofficially it was the voyage of "Molly Brown." During Project Mercury, each pilot had named his own spacecraft, although Cooper had some trouble selling NASA on Faith 7 for the last spacecraft in the program. Grissom and Young now had the same difficulty with "Molly Brown." Grissom had lost his first ship, Liberty Bell 7, which sank after a faulty circuit blew the hatch before help arrived. "Molly Brown," the "unsinkable" heroine of a Broadway stage hit, seemed to Grissom the logical choice for his second space command. NASA's upper echelons thought the name lacking in dignity; but since Grissom's second choice was "Titanic," they grudgingly consented, and the name remained "Molly Brown," though only quasi-officially. Later spacecraft were officially referred to by a Roman numeral, although a few had nicknames as well. "Molly Brown" lifted off so smoothly that neither Grissom nor Young felt anything. Their real cues were seeing the mission clock on the instrument panel start running and hearing Cooper announce it from mission control. There was less noise than they had heard on the moving-base simulator in Dallas. When the first-stage engine cut off two and a half minutes later, acceleration plunged from six gravities to one. The second-stage engine ignited, bathing the spacecraft in a flash of orange-yellow light that disconcerted Young for the moment it took him to realize that this was a normal product of fire-in-the-hole staging - that is, second-stage ignition before, instead of after, separation. The launch vehicle had slightly exceeded its predicted thrust, but a warning from Cooper prepared the pilots for the larger than expected pitchdown when the second stage took over the steering. Young, who had never been in space before, was entranced by his view of Earth's horizon and the sense of rapid motion as second-stage thrust built up. Five and a half minutes after launch, the second-stage engine shut down. The pop of the pyrotechnics that severed spacecraft from launch vehicle sounded like the bark of howitzers to Young. Grissom fired the aft thrusters to kick the spacecraft into orbit. He lost track of the time and fired too long, ending up with his incremental velocity indicator showing 2 a slight overspeed. But he wound up with an orbit of 122 by 175 kilometers, very close to the intended 122 by 182 kilometers. Gemini 3 was off to a good start - to an almost trouble-free flight that closely matched the planned mission. The match was not perfect. About 20 minutes into the first orbit, just after "Molly Brown" passed beyond range of the mid-Atlantic Canary Island tracking station, the oxygen pressure gauge in the environmental control system reported an abrupt drop. Young, assigned to watch this gauge, naturally assumed that something was wrong with the system. But a quick glance showed odd readings on several other meters and suggested that the real trouble might be in the instrument power supply. Young switched from the primary to the secondary electrical converter to power the dials, and the problem vanished. The whole episode, from Young's first notice of the anomalous reading to his shift from primary to secondary power, took 45 seconds, one clear payoff from intense preflight training. Grissom's attempt to run the cell-growth experiment was a failure - perhaps, as he remarked later, because he had "too much adrenalin pumping" and twisted the handle too hard. Whatever the reason, the handle broke, ruining the experiment. The radiation experiment gave Young some trouble, but he managed to complete his task. Results were suggestive but inconclusive. Exposed to nearly identical doses of radiation, the inflight blood samples showed more damage than the control samples on the ground. While the effect was small, it did point to interaction between radiation and some aspect of space flight, though just which aspect and how it acted could not he answered. Both Grissom and Young believed that most of the trouble with the experiments stemmed from differences between the packages they flew with and those they had trained with. But they also admitted that they "were not quite as fascinated by sea urchins . . . As . . . By the chance to carry out some real 'firsts' in space flight." And the Gemini 3 crew did chalk up at least one historic first by maneuvering in orbit. The first OAMS burn came an hour and a half after launch and lasted a carefully timed 75 seconds, cutting spacecraft speed by 15 meters per second and dropping it into a nearly circular orbit. Three quarters of an hour later, during the second revolution, Grissom fired the system again, this time to test the ship's translational capability and shift the plane of its orbit by one-fiftieth of a degree. During the third pass, Grissom completed the fail-safe plan with a two and a half minute burn that dropped the spacecraft's perigee to 72 kilometers and ensured reentry even if the retrorockets failed to work. They did work, however. As the three-orbit mission neared its close, Grissom and Young ran through the retrofire checklist. With everything ready, the pilot fired the pyrotechnics that separated the adapter from the reentry module, giving the two spacemen their biggest jolt so far. He then armed the automatic retrofire switch. One after the other, the four rockets exploded into life and burned themselves out. Another set of pyrotechnics cut loose the expended package as "Molly Brown" arced back toward the planet she had left four and a half hours before. Reentry produced some surprises. At the outset, it matched the simulations both men had been through in training, even to the color and pattern of the plasma sheath that surrounded the spacecraft. Young threw the switch to start the reentry communications experiments just over a minute after the plasma had formed and communications had blacked out. The results were encouraging; at high rates of water flow, both UHF and C-band signals from the spacecraft were picked up by ground stations. But "Molly Brown" seemed to be off course. The initial computer reading showed that she would miss her planned landing point by more than 69 kilometers, and Grissom's best efforts to reduce that gap were fruitless. Theoretically, the Gemini spacecraft had enough lift to be piloted to a relatively precise landing, but its real lift fell far short of what had been predicted from wind tunnel tests. As a result, Gemini 3 was about84 kilometers short of the intended splashdown point. Before they touched down, however, the astronauts suffered another jolt when the spacecraft assumed its landing attitude. After the main parachute deployed, the spacecraft hung from it vertically, with its nose suspended at a single point. Before landing, throwing a cabin switch shifted the spacecraft to a two-point suspension with its front end forward and some 35 degrees above the horizontal. When Grissom hit the landing attitude switch, "Molly Brown" literally dropped into place, pitching both men into the windshield, breaking Grissom's faceplate, and scratching Young's. The jolt when they hit the water a few minutes later was mild by comparison. Although Gemini was designed to float, all Grissom saw out his window was water. He realized that the still attached parachute was being dragged by the wind, tugging the nose of the spacecraft down. With memories of the ill-fated Liberty Bell 7 momentarily staying his hand, Grissom released the chute and "Molly Brown" bobbed to the surface, having shown herself fully watertight. The mission plan called for the crew to remain on board until the spacecraft was picked up, a short wait if the recovery ship, the aircraft carrier Intrepid, was only about eight kilometers away, as Grissom and Young had last heard before they splashed down. When they learned that the real distance was closer to 110 kilometers, Grissom asked for a helicopter to pick them up and take them to the carrier. Still thinking of Liberty Bell 7, however, he refused to crack a hatch until Navy swimmers had attached a flotation collar to "Molly Brown." This spacecraft was not going to sink, but the crew endured a long 30 minutes as the sealed spacecraft grew hotter inside while it pitched and tossed on the long Atlantic swells. "That was no boat," recalled Young. Heat and motion took their toll of Grissom, although Young managed to keep his breakfast down. Once the collar was in place and a swimmer opened a hatch, the two men lost no time in getting out and putting on the "horse collar" hoists that lifted them to the helicopter. Medical examinations and debriefings began as soon as the two astronauts were in the helicopter and went on for several days. A brief stir ensued when Grissom and Young had little to say to scientists about their observations, mainly astronomical, while in orbit. Other questions were raised about the failure of the cell- growth experiment, but most of the fault could be ascribed to a poorly designed package that was installed in the spacecraft barely a week before flight - a matter of "too little, too late." In any case, the brief mission had centered on engineering evaluation of the spacecraft, with a full schedule that left little time for extra work. Something of a storm later blew up when the press got wind of Grissom's having eaten part of a corned beef sandwich during the flight. Schirra had bought it at "Wolfie's" on North Atlantic Avenue in Cocoa Beach and given it to Young, who smuggled it on board the spacecraft. When it was time for the crew to eat the space food they carried, Young brought out the sandwich and handed it to Grissom, who ate only a few bites as he wanted no crumbs floating around the cabin. When the news got to Congress, the lawmakers were upset. What was not made clear, apparent to either the legislators or the press was that the official food was only there for evaluation of its taste, convenience, and reconstitution properties and had nothing to do with any scientific or medical objectives of the mission. No one expected to learn very much about the effects of space food on so short a flight. The fracas did, however, produce some new and more stringent rules about what the astronauts might take with them on future missions. Despite its minor problems, Gemini 3 was a complete success as far as its major objectives were concerned. There could he no doubt that Gemini was ready for its role in the manned space flight program. The time of testing was over. If either one of these things (Food packages) leaks, we can just close up shop. Roger. AV,90. GMTRC 16 52 25. GETRC 02 28 35. Roll left 55. Roger. Two-Bravo: 90 AV. 16 52 25 GMTRC. Elapsed time of 02 28 25. Roll left 55. I brought it with me. Let's see how it tastes. It was a thought, anyway. Look at 'em (Food bags) jumping around down there. 160 nose down is what it is. No, I'll tell you, I need some of these missions where I can look out of the window. I haven't looked out of this window a second and a half. You don't mind if I make an in-flight modification to the pressure suit, do you? I hope you don't cut a hole in it. Be sure I don't throw any switches over there while I'm moving around. No, I'll keep a check on you. I don't believe that scanner's doing the right thing by us at all. If it is, the ball isn't. Want this bag for anything? Yes, I put the paper towels back in it. Okay, I can thrust now? Wait till I get my suit zipped up. Pulse. Going to use those stars. There's zero roll all right. Well, that's great! I can't bust up the bag. Sure like to get that smell out of here and the only way I can do it is to bust that bag. I mean this bactericide bag. Let's see. You don't see the moon any place, do you? It'll be coming up over my -- on my right here pretty soon. Boy, I tell you I really dig this zero g. This is the finest way to go I ever saw. That looks about right in pitch. Roll is off. Can you stick this on your side? That mess? Doesn't that go in your food box? Would if there was any room in it. I don't have any room. Drop it back behind the seat, I guess. Landing attitude cover open. I thought it was para-jett. 300 feet. It ought to be pretty soon now. Broke my face plate when we went to landing attitude. Look at the smoke coming out the thrusters. We better go to O2 High Rate and close the snorkel. This is Molly Brown in the water. Anybody read? Molly Brown, this is Big Box 15. You are loud and clear. Check with Big Box 14. Roger. We're floating well in the water. Family: Manned spaceflight. People: Grissom, Young. Country: USA. Spacecraft: Gemini. Launch Sites: Cape Canaveral. Agency: NASA Houston. The pad crew finishes work on GT-3 prior to the first manned Gemini launch. 1962 September 4 - . Radar and rendezvous evaluation pod for Gemini 2 and 3. - . Nation: USA. Flight: Gemini 3. Spacecraft: Gemini, Gemini Radar, Gemini REP.
Gemini Project Office directed McDonnell to provide spacecraft No. 3 with rendezvous radar capability and to provide a rendezvous evaluation pod as a requirement for missions 2 and 3. Four pods were required: one prototype, two flight articles, and one flight spare. 1963 February 28 - . 1963 June 15 - . Gemini Project Office (GPO) reported that the first manned Gemini mission would be three orbits. - . Nation: USA. Flight: Gemini 3. Spacecraft: Gemini. Whether so short a mission would allow time to perform the rendezvous experiment called for by the original mission plan remained in doubt, although Flight Operations Division's Rendezvous Analysis Branch had decided during the week of June 2 that a three-orbit mission was long enough to conduct a useful experiment. GPO had directed McDonnell to study the problem. 1963 September 3 - . LV Family: Titan. Launch Vehicle: Titan II. A Mission Planning Coordination Group was established. - . Nation: USA. Flight: Gemini 3. Spacecraft: Gemini. Delays in the fuel cell development program - . Nation: USA. Flight: Gemini 3. Spacecraft: Gemini, Gemini Fuel Cell. Delays in the fuel cell development program prompted Gemini Project Office to direct McDonnell to modify the electrical system for spacecraft No. 3 so that either fuel cells or a silver-zinc battery power system could be installed after the spacecraft had been delivered to the Cape. A contract change incorporating this directive was issued January 20, 1964. 1963 November 13 - . LV Family: Titan. Launch Vehicle: Titan II. 1963 December 13 - . LV Family: Titan. Launch Vehicle: Titan II. Gemini launch vehicle (GLV) 3 in assembly - . Nation: USA. Flight: Gemini 3. Spacecraft: Gemini. Martin-Baltimore received the propellant tanks for Gemini launch vehicle (GLV) 3 from Martin-Denver, which had begun fabricating them in June. Splicing the oxidizer and fuel tanks for each stage was completed April 17, 1964. Flight engines arrived from Aerojet-General on May 10, and installation was completed June 6. Final horizontal tests of the assembled launch vehicle began June 1 and were concluded on June 17 with an Air Force inspection of GLV-3 before the vehicle was erected in the vertical test facility. Gemini Project Office (GPO) reported that a silver-zinc battery power system would be flown in spacecraft 3. - . Nation: USA. Flight: Gemini 3. Spacecraft: Gemini, Gemini Fuel Cell. Gemini Project Office (GPO) reported that a silver-zinc battery power system would be flown in spacecraft 3. Gemini Project Office (GPO) reported that a silver-zinc battery power system would be flown in spacecraft No. 3 instead of a fuel cell system, which could not be qualified in time for the mission. Late in January, 1964, McDonnell reviewed for GPO the status of the fuel cell program and discussed the design of an improved fuel cell into spacecraft No. 5 and to delete fuel cells from spacecraft Nos. 3 and 4, substituting the battery power system. 1964 February 2 - . Manufacture of the heatshield for spacecraft No. 3 was completed. - . Nation: USA. Flight: Gemini 3. Spacecraft: Gemini. This shield was the first production article with the full thickness of 1.0 inch; shields for spacecraft Nos. 1 and 2 were about half as thick..
1964 April 15 - . LV Family: Titan. Launch Vehicle: Titan II. Gemini manned flight could be accomplished in 1964. - . Nation: USA. Flight: Gemini 3. Spacecraft: Gemini. After reviewing the results of Gemini-Titan (GT) 1, the Gemini Management Panel remained optimistic that manned flight could be accomplished in 1964. According to the work schedule, GT-2 could fly on August 24 and GT-3 on November 16, with comfortable allowances for four-week slips for each mission. Some special attention was devoted to GT-2, where the spacecraft had become the pacing item, a position held by the launch vehicle on GT-1. Spacecraft No. 2 systems tests had started one month late but were proceeding well. In addition, the schedule looked tight for starting spacecraft No. 3 systems tests on June 1. 1964 May 1 - . The spacecraft computer formal qualification unit completed Predelivery Acceptance Tests (PDA) and was delivered to McDonnell. - . Nation: USA. Flight: Gemini 3. Spacecraft: Gemini, Gemini Inertial Guidance System. The spacecraft computer formal qualification unit completed Predelivery Acceptance Tests (PDA) and was delivered to McDonnell. The flight unit for spacecraft No. 2 was delivered during the first week in May. Later in the month, a complete inrtial guidance system formal integration PDA was completed on spacecraft No. 2 (May 22). The spacecraft No. 3 flight unit completed PDA on June 6. 1964 May 11-12 - . LV Family: Titan. Launch Vehicle: Titan II. Gemini-Titan 3 crews inspect crew station mock-up - . Nation: USA. Flight: Gemini 3. Spacecraft: Gemini. 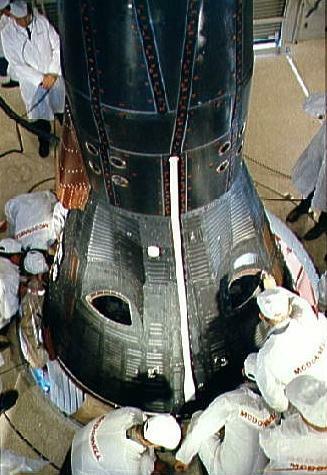 Primary and backup crews for Gemini-Titan 3 inspected a spacecraft No.3 crew station mock-up at McDonnell. They found all major aspects of the crew station acceptable. A few items remained to be corrected but would not affect the launch schedule..
Gemini spacecraft No. 3 began Phase I modular Spacecraft Systems Tests - . Nation: USA. Flight: Gemini 3. 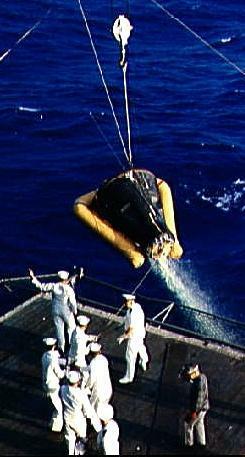 Spacecraft: Gemini, Gemini Parachute. Gemini spacecraft No. 3 began Phase I modular Spacecraft Systems Tests (SST) at McDonnell under the direction of the Launch Preparation Group. The Development Engineering Inspection of the spacecraft was held June 9-10. The new rendezvous and recovery section, incorporating the high-altitude drogue parachute, was installed and checked out during July and August. Modular SST and preparations for Phase II mated SST were completed September 12. 1964 June 8 - . LV Family: Titan. Launch Vehicle: Titan II. Gemini launch abort training - . Nation: USA. Flight: Gemini 3. Spacecraft: Gemini. Group 1 (selected April 1959) and Group 2 (September 1962) astronauts averaged approximately 100 runs each whereas Group 3 (October 1963) astronauts completed 32 runs apiece. The Gemini-Titan 3 launch profile was simulated in detail, including such cues as noise, vibration, pitch and roll programming, and other motion cues which results from various launch anomalies. The training was completed July 30. 1964 June 19 - . LV Family: Titan. Launch Vehicle: Titan II. Stage I of Gemini launch vehicle 3 was erected in the vertical test facility at Martin-Baltimore. - . Nation: USA. Flight: Gemini 3. Spacecraft: Gemini. Stage II was erected June 22. Power was first applied June 29, and subsystems functional verification testing concluded July 31..
1964 August 7 - . LV Family: Titan. Launch Vehicle: Titan II. Amendment to the Gemini flight suit contract, - . Nation: USA. Flight: Gemini 3. Spacecraft Bus: Gemini space suits. Spacecraft: G3C, Gemini. Manned Spacecraft Center (MSC) Procurement and Contracts Division reported that the amendment to the Gemini flight suit contract covering G3C flight suits and related equipment for Gemini-Titan (GT) 3 had been sent to the contractor, David Clark Company. The first four Gemini flight suits, to be used in GT-3, were delivered to MSC late in August. Because of earlier problems in fitting training suits, astronauts had had preliminary fittings of the flight suits before final delivery. 1964 September 13 - . LV Family: Titan. Launch Vehicle: Titan II. 1964 October 7 - . LV Family: Titan. Launch Vehicle: Titan II. Gemini launch vehicle (GLV) 3 review - . Nation: USA. Flight: Gemini 3. Spacecraft: Gemini. The vehicle acceptance team for Gemini launch vehicle (GLV) 3 met for the second time to review test and manufacturing data at Martin-Baltimore. The meeting concluded on October 9 with the vehicle found acceptable and Martin was authorized to remove it from the vertical test cell. After final checks, weighing, and balancing, GLV-3 passed roll-out inspection on October 27 and was turned over to the Air Force. Air Force Space Systems Division formally accepted GLV-3, following a review of launch vehicle status and correction of discrepancy items. Gemini mission simulator at the Cape operational. - . Nation: USA. Flight: Gemini 3. Spacecraft: Gemini. The Gemini mission simulator at the Cape, configured in the spacecraft No. 3 version, became operational; during the next three weeks, some 40 hours of flight crew usage and three hours of other Manned Spacecraft Center personnel usage were logged..
1964 November 24 - . LV Family: Titan. Launch Vehicle: Titan II. Gemini launch vehicle (GLV) 3 was scheduled to be shipped from Martin-Baltimore to Cape Kennedy. - . Nation: USA. Flight: Gemini 3. Spacecraft: Gemini. Shipment was delayed, however, because GLV-2 had not yet been launched; and several modifications, scheduled for the Cape, were made at Baltimore instead. All work was completed by January 14, 1965; the vehicle was reinspected and was again available for delivery. Preparations for shipment were completed January 20, and stage II was airlifted to Cape Kennedy January 21, followed by stage I January 23. 1964 December 19 - . Gemini spacecraft No. 3A began thermal qualification tests in the altitude chamber at McDonnell. - . Nation: USA. Flight: Gemini 3. Spacecraft: Gemini. During test No. 1 (December 19-21), the spacecraft coolant system froze. Over the next three weeks, the coolant system was retested and redesigned. The modified coolant system was subsequently installed in other spacecraft. Test No. 2 was run January 6-13, and the test program ended February 19 with the third test run. The three test runs in total simulated over 220 orbits. 1965 January 4 - . McDonnell delivered Gemini spacecraft No. 3 to Cape Kennedy. - . Nation: USA. Flight: Gemini 3. Spacecraft: Gemini, Gemini Radar. After its receiving inspection had been completed (January 6), the spacecraft was moved to the Merritt Island Launch Area Radar Range for a communications radiation test. This test, performed only on spacecraft No. 3 because it was scheduled for the first manned mission, exercised spacecraft communications in a radio-frequency environment closely simulating the actual flight environment. The test was run January 7, and the spacecraft then began preparations for static firing. Gemini spacecraft No. 3 thrusters static fired. - . Nation: USA. Flight: Gemini 3. Spacecraft: Gemini, Gemini OAMS/RCS. 1965 January 22 - . 1965 January 25 - . LV Family: Titan. Launch Vehicle: Titan II. 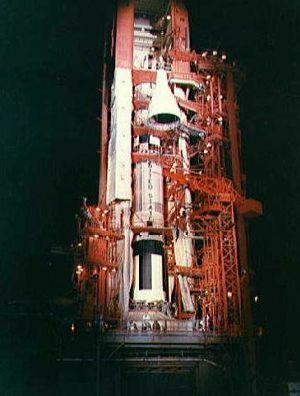 Gemini launch vehicle 3 was erected at complex 19. - . Nation: USA. Flight: Gemini 3. Spacecraft: Gemini. Power was applied January 29 and Subsystems Functional Verification Tests (SSFVT) commenced. SSFVT were finished February 12. The Combined Systems Test before spacecraft mating was conducted February 15-16..
1965 January 29 - . LV Family: Titan. Launch Vehicle: Titan II. Qualification testing for Gemini-Titan 3 - . Nation: USA. Flight: Gemini 3. Spacecraft: Gemini. Qualification testing of the food, water, and waste management systems for the Gemini-Titan 3 mission was completed. .
1965 February 17 - . LV Family: Titan. Launch Vehicle: Titan II. Gemini launch vehicle 3 and spacecraft No. 3 were mechanically mated on complex 19. - . Nation: USA. Flight: Gemini 3. Spacecraft: Gemini. The Electrical Interface Integrated Validation Test was completed February 19, the Joint Guidance and Control Test on February 22. Gemini-Titan 3 combined systems testing included the Joint Combined Systems Test on February 24 and the Flight Configuration Mode Test on March 3. 1965 February 26 - . LV Family: Titan. Launch Vehicle: Titan II. Rehearsal of the flight crew countdown for Gemini-Titan 3 - . Nation: USA. Flight: Gemini 3. Spacecraft: Gemini. 1965 March 1-2 - . LV Family: Titan. Launch Vehicle: Titan II. Gemini certified for manned space flight - . Nation: USA. Flight: Gemini 3. Spacecraft: Gemini. 1965 March 8 - . LV Family: Titan. Launch Vehicle: Titan II. The Wet Mock Simulated Launch of Gemini-Titan 3 was successfully conducted. - . Nation: USA. Flight: Gemini 3. Spacecraft: Gemini. Countdown exercises were concluded on March 18 with the Simulated Flight Test..
1965 May 5 - . Landing point error of Gemini 3 discussed. - . Nation: USA. Flight: Gemini 3. Spacecraft: Gemini. Discussing the landing point error of Gemini 3, Charles W. Mathews told the Gemini Management Panel that the spacecraft had developed a smaller angle of attack than planned and that the lift capability had been less than wind tunnel tests had indicated. .